Wellesley College can attest to being one of few colleges and universities whose art is as well traveled as its graduates. The Davis regularly receives requests from museums around the world for loans of works from its collections. 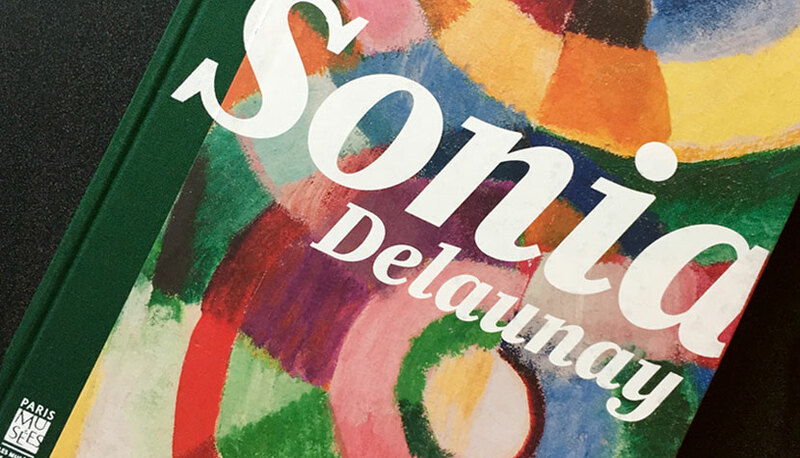 This year, a stunning 1913 painting by Sonia Delaunay-Terk, Electric Prisms, is featured in an exhibition of the artist’s work that is currently on view in the Musée d’Art Moderne de la Ville de Paris, and will travel to Tate Britain in April 2015. Electric Prisms was selected as the cover image for the exhibition catalog, which is available in both French and English, and it is featured in posters, invitations, brochures, press information, and other pieces representing the exhibition. Art aficionados unable to visit either of those European exhibitions may still have an opportunity to view another magnificent work on loan from the Davis with a visit to the Museum of Modern Art in New York. The groundbreaking exhibition Henri Matisse: The Cut-Outs, currently on view at MoMA, includes Matisse's Composition, Black and Red (1947) from the Davis collection. The Davis’ Matisse (shown during installation, above) can be viewed along with the monumental installation collage, The Swimming Pool, which for reasons of conservation, has not been seen for more than two decades. Because of safety considerations, MoMA will be the single venue at which Composition, Black and Red will join the traveling exhibition. It is a fitting place, given the connection of the museum to the donor of the Wellesley piece. In 1959 Professor and Mrs. John McAndrew offered Composition, Black and Red to the Farnsworth Museum at Wellesley College (whose collections were later moved to the Davis) to support the College’s educational mission. John McAndrew was the first curator of architecture at MoMA before his appointment as Wellesley College Museum Director in 1947. The Davis continues to foster Wellesley’s extensive associations with museums throughout the country and the world. In addition to the loans noted, pieces from the Davis collections may also currently be viewed in half a dozen other museums in the United States and Canada. Likewise, the Davis is pleased to present, on occasion, notable works from the collections of other prestigious museums, which have included the Metropolitan Museum of Art, the Smithsonian, the National Gallery of Art, and the Victoria and Albert Museum. Of course, the most direct means of enjoying the Davis collections is a visit to the Davis! The Museum welcomes visitors on campus 11 a.m.–5 p.m. Tuesday through Sunday.